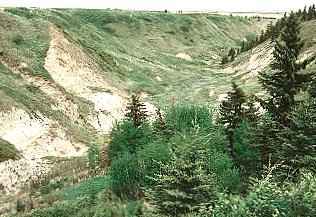 After crossing the south badland basin and heading north-east, the hiker runs into a coulee of badlands.� At this point, the bottom of the coulee is only large enough for a dried out stream bed.� It temporarily provides the hiker with some easy footing. 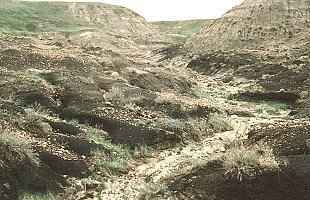 At one point, the layer of ground you are walking on is a layer of coal. 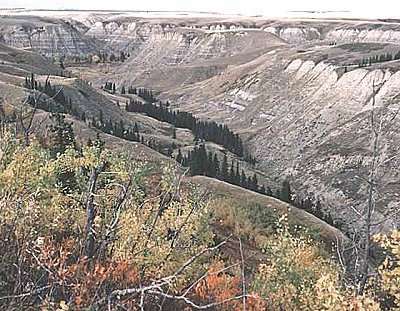 Further on, the coulee opens out into a plateau. Then, as you see in this photo, it becomes shallow. The hiker has an easy stroll downhill. Soon you come to some trees which are so dense that very little sun makes it to the ground. 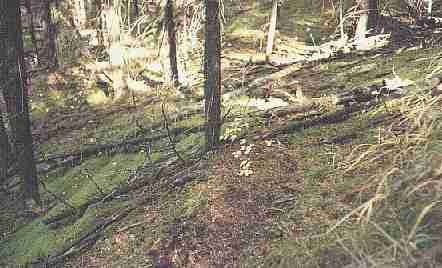 As a result, the trees are dead at the bottom, the path is soft, and you can see lots of moss to the left. From here on, there is about a 3 Km stretch of forest. 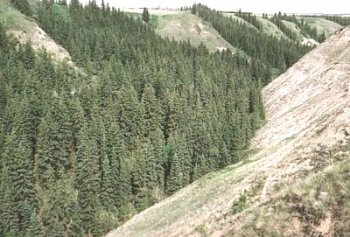 � Hiking through trees is appreciated on a hot day.� If paths were built through here, they would provide a unique experience because most of the� Drumheller area is barren land. 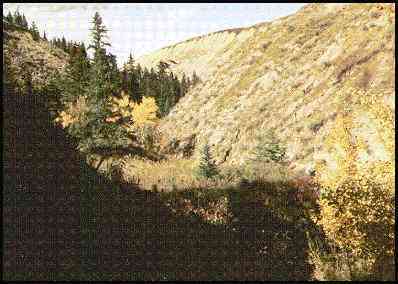 Unfortunately, people seldom hike through here, so there are no easy paths to walk on.� The animal paths through the trees lack footing, and there are dried out branches from dead bushes which can break off and stab the hiker.� This adds some real danger to the hike. As I made my way along the rough paths, I came to a clearing where I ran across this guy. 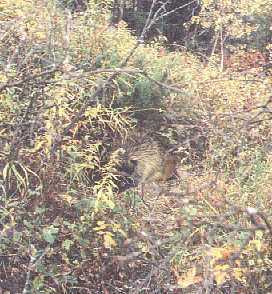 The porcupine wouldn't move so I had to walk around on my way down the valley. Towards the far end of the canyon, this is the view I was left with. By the time I reached this point, I was very tired and decided to look for a way out. 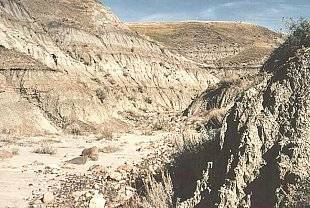 If you plan on hiking any part of the east leg of Horseshoe canyon, use this link. It will give you three photos, a map, and a more detailed description (88 km) of what to expect and what difficulties you might encounter. When I saw an easy route to the top of the valley, I climbed out. It would be easier walking back across the flat prairie. � At the top, I walked across a field and found this view of my planned destination.